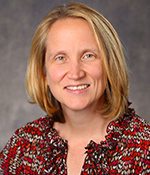 K. Lori Hanson, Ph.D., joined The Children’s Trust in December 2003. She oversees a team of talented professionals focused on ensuring key data and information are available to inform policy decisions regarding children and families in the community. Her responsibilities include the implementation of organizational strategic planning, community research regarding the needs and well-being of children, program evaluation of The Trust’s major service initiatives, and contract-level performance metrics that support continuous learning and program quality improvement. Dr. Hanson is a licensed psychologist and earned her Ph.D. at Saint Louis University in St. Louis with a clinical psychology internship at the University of Miami’s Mailman Center for Child Development specializing in pediatric and child clinical populations. She is trained in Results-based Accountability (RBA), a framework used by The Children's Trust for moving from talk to action to improve quality of life as well as outcomes for children and families in Miami-Dade. Prior to joining The Trust, Dr. Hanson served as a faculty member of the University of Miami School of Medicine, department of pediatrics, where she was a principal investigator and coordinator for multiple early intervention and maternal-child health studies and service programs.